This was a very interesting book. It is not typically my genre of book I read only because it involves the Paranormal, which is typically not the type of genre I enjoy reading, but, for those of you who like the paranormal genre, you will most likely love this book! You don’t really know if you are reading a mystery or a fantasy, as it seems to go back and forth as you try to decide which it is. This part did intrigue me as I tried to make sense of this myself, and could not quite decide. This book is about young girl named Lisa, who is 12 years old, who wanders into the woods behind her house one day and disappears 15 years ago. Everyone believes she wanted to become the Queen of the Fairies, as she often had gone into the woods behind her house searching for the fairies, and the King of the Fairies. She has never been found since she disappeared. This has impacted her family in a many ways, especially by her younger brother, Sam, who entered into a pact with others that if they could find her he would promise . . . can’t give spoilers!. The story is interesting and keeps you reading. The characters are well developed, yet I did feel as if this book was a little long and drawn out. By the time we get towards the end of this book, we are flooded with most of the answers/secrets all at once that had been kept from everyone, especially her brother, Sam, who had never stopped looking for her. These answers that have come out stand to impact the lives of the two main characters, Sam and his girlfriend, Phoebe, to the extreme. We are left wondering, as does Phoebe, after a major life event, if, in fact, this secret that has come out is reality or not. This book leaves you hanging here. It is left so you wonder if a sequel might be next, or if this is just the end of the book. It is left open ended. Hmmmm? I received this book “free” and was not provided with any monies to read and write a review about this book. I received this book from Harper Collins, through NetGalley.com, through their book reviewers program. I was not required to write a positive review. The opinions expressed are my own. I am disclosing this in accordance with the Federal Trade Commission’s 16 CFR, Part 255, http://www.access.gpo.gov/nara/cfr/waisidx_03/16cfr255_o3.html Guides Concerning the Use of Endorsements and Testimonials in Advertising. Thanks for stopping by! 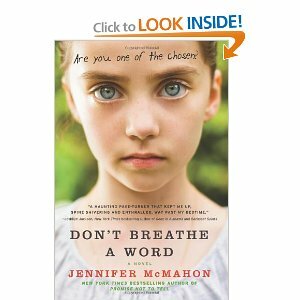 Yes, Don't Breathe a Word by Jennifer McMahon was a great read. I wish I had more knowledge of fairies, as I probably could have understood a lot of the book better in regards to them. Funny thing is I love Fairies. I have them scattered around my house, yet I don't 'know' about them, what their purpose is, what they are supposed to do, etc! I just think they are beautiful! The book was good. It really did keep you wondering all along if things were reality or not! You should give it a try! Plan on not wanting to put it down. The story is so intriguing you want to keep reading to try to figure things out! Enjoy! Again, thanks for coming by! MIDSUMMER'S EVE BLOG HOP GIVEAWAY!!! In My Mailbox!!!!! I'M SOOOOO EXCITED!!!!! !